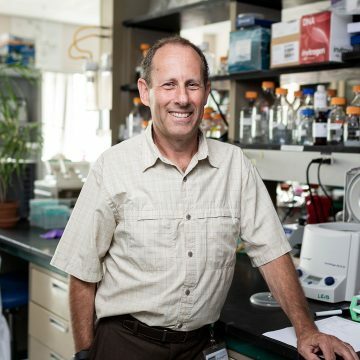 David A. Leib, PhD, has been named the Chair of the Department of Microbiology and Immunology at Dartmouth’s Geisel School of Medicine. Leib is a professor of microbiology and immunology and adjunct professor of biology at Dartmouth. Since joining Dartmouth in 2009, Leib has built a successful research program focusing on discovery and elucidation of new vaccines and therapeutics for neonatal herpesvirus (HSV) infections. In addition to his research efforts, Leib also teaches undergraduate and graduate courses in virology at Dartmouth. Leib grew up in London, England, within shouting distance of the famed Wembley Stadium, home of his favorite sport, soccer. He earned a BSc in microbiology at Birmingham University in 1983, then completed his PhD in 1986 at Liverpool University where he studied non-human primate herpesviruses. Leib continued his studies in the U.S. as a postdoctoral fellow at Harvard University in the lab of noted herpes virologist Priscilla Schaffer. In 1990, he joined the faculty at Washington University in the Departments of Ophthalmology and Visual Sciences and Molecular Microbiology. In St. Louis, Leib’s lab continued to study HSV pathogenesis, focusing on innate immunity and HSV countermeasures. The lab also developed new ways to image HSV infection and spread using real-time bioluminescence imaging. In 2009, Leib joined the Geisel School of Medicine faculty as a professor and moved his lab to Dartmouth. When not in lab Leib can be found with his family, hiking, watching, playing or coaching soccer, and dreaming that England will someday win the World Cup again. Founded in 1797, the Geisel School of Medicine at Dartmouth strives to improve the lives of the communities it serves through excellence in learning, discovery, and healing. The Geisel School of Medicine is renowned for its leadership in medical education, health care policy and delivery science, biomedical research, global health, and in creating innovations that improve lives worldwide. As one of America’s leading medical schools, Dartmouth’s Geisel School of Medicine is committed to training new generations of diverse leaders who will help solve our most vexing challenges in health care.